Russia. Ivan III. AD 1462 to 1505. Denomination : Silver Denga. Mint : Moscow. Size : 9.0 x 14.3 mm. Weight : 0.41 grams. This is a fairly small coin. Grade : gVF (as struck) but slightly off-centre as is typical for these. 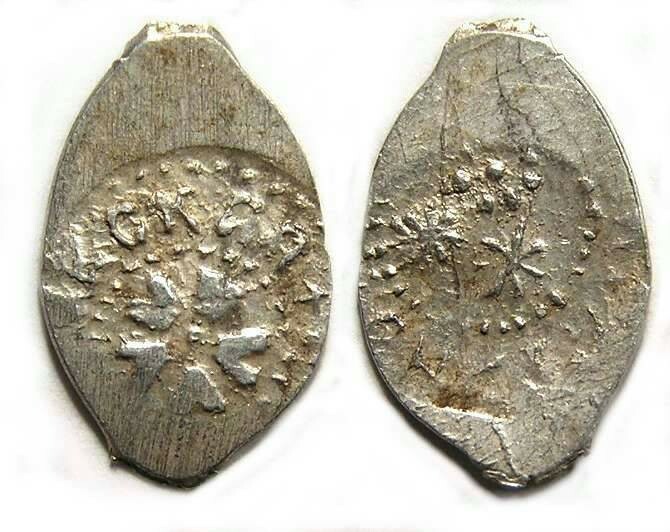 Obverse : Two stars with what appears to be a floral splay, with a Cyrillic inscription around. Reverse : Flower with a Cyrillic inscription naming the mint around. These small coins are commonly known as wire money as they were struck on flans cut from lengths of wire. All have shear marks at the ends, resulting from how the wire was cut up. The flans are generally smaller than the dies, so only very rarely will very well centered specimens with everything on the flan be encountered (never for some issues).